All this fall, Tony and I have been spending our Monday nights at Valerie and Andrew's apartment, eating dinner, hanging out and watching The Walking Dead. (Except we haven't seen the mid-season finale yet - no spoilers!) Valerie and Andrew both are great cooks, and a few weeks ago Andrew made us a pesto-spinach-feta pizza that I have not been able to get out of my head. So when Dena came over to our house for dinner Sunday, I wanted to replicate the deliciousness that Andrew created. You will love this pizza. For the crust, I used my hands-down favorite crust recipe from Cook's Country, which is crispy like Pizza Hut crust. As you start on the dough, heat the oven to 200 degrees. When it comes to temperature, turn it off. In a saucepan, heat milk to almost boiling. Off heat, add sugar and 2 tablespoons olive oil. In a stand mixer bowl, mix flour, yeast and salt. With the dough hook attached and the mixer on speed 2, slowly add the milk mixture. When dough comes together, continue mixing for 5 minutes. Shape dough into a ball with your hands and placed into a greased bowl. Cover and set in warm oven for 30 minutes. Meanwhile, prepare the pesto. In a frying pan, toast the nuts over medium heat. Then add all of the ingredients to a food processor and pulse until pesto comes together. Prepare two 9-inch round cake pans by placing 3 tablespoons of olive oil in each pan. Note: 8-inch pans also will work. Once dough has risen, divide in half. Use a rolling pin to roll each half into a 9-inch circle. Place dough into the prepared pans. Cover and let sit for 20 minutes. After dough has risen, poke each crust with a fork 8 times. 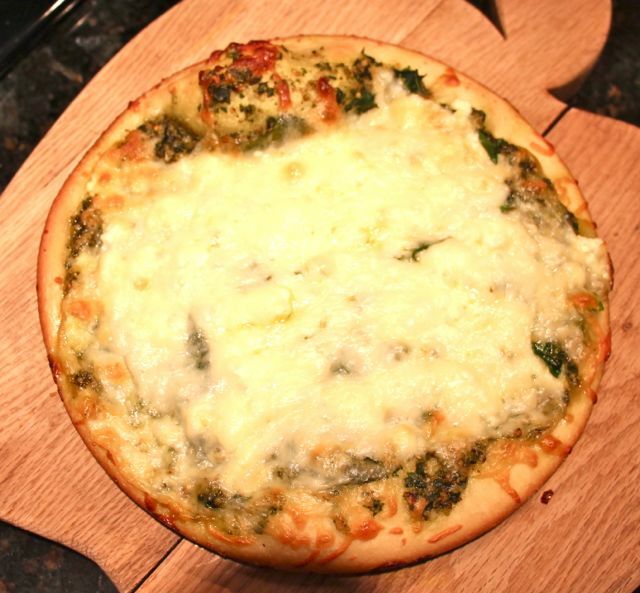 Top each pizza with 1/3 cup to 1/2 cup pesto. Add half of the spinach, half of the feta and half of the mozzarella to each pizza. Bake for 20 minutes at 400 degrees. Remove from oven and let sit for 1 minute. Use a flexible spatula to slide the pizza from the pan and onto a cutting board. Cut each pizza into six pieces.